Macklin, T. Eyre, “Illustration on Page 328a of the  Walter Scott, Ltd. 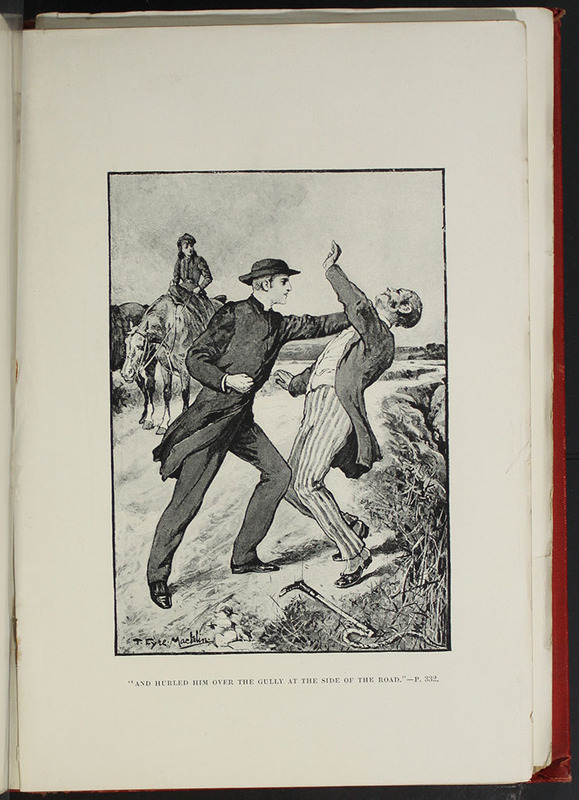 Reprint Depicting the Horse Whipping Scene,” Wide, Wide World Digital Edition, accessed April 22, 2019, http://widewideworlddigitaledition.siue.edu/items/show/1708. This black and white illustration is a scene from page 328, of the 1896 Walter Scott, Ltd. Reprint. This is the horsewhipping scene. The two men, John and Mr. Saunder's are in a physical struggle. John, dressed in his reverend's black garb, is shoving the dandy Mr. Saunders toward the gully by the side of the road. Mr. Saunders is dressed much brighter, in striped pants, and light shirt and coat. Ellen is dressed darkly as well, sitting on her Brownie, as she watches on. The gully itself, looks treacherous with jagged rocks and thorny foliage to greet Mr. Saunder's when he falls in.